At Safe Food Training, our focus is usually on keeping your food safe and food manager certification in MN, but from time to time, we like to provide useful information on how to keep your employees safe when on the job. Hopefully, you do everything that you can to prevent on the job accidents, but there are many hazards in the food service industry so you need to make sure that your first aid kit is fully stocked and handy in case of an on the job incident. Whenever there is a minor on the job injury in the kitchen, the first place employees look for aid is your first aid kit. Here are some items that we feel are essential to have on hands in the event of an accident. While this list is far from complete, these five items will come in handy for situations that commonly occur in commercial kitchens. We do recommend that you have nearly every style of Band-Aid available for your staff. With sharp knives and utensils in use in every kitchen it’s inevitable that employees will cut themselves from time to time, and they’ll need access to the appropriate bandage. With industrial steamers, ovens, deep fryers posing a constant burn threat, some form of burn cream must be stocked in your first aid kit as well as gauze pads large enough cover major burns. Remember to always run burns under cold water as soon as possible and clean the area before covering to prevent infection. Even though you have single-use food service gloves in ample supply in your kitchen, it is a good idea to keep a box of them in your first aid kit. A member of your staff assisting a fellow coworker with a burn or cut should wear gloves to prevent contaminates from their hands being transferred to the injured area and prevent them from coming into contact with the blood of the inured staff member. 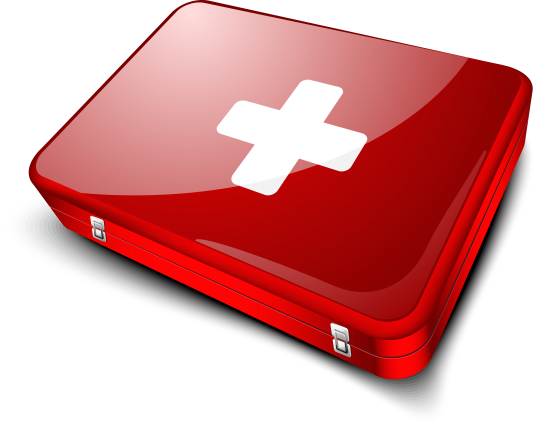 Our last piece of advice is to keep your first aid kit in an easily accessible location. It will do you no good stored in the employee break room if you have an incident on your production floor. During our food manager certification MN classes, we often hear stories about empty first aid kits. If we’ve missed any essentials, we’d appreciate if you’d leave a comment below indicating what items you feel belong in your kitchen’s first aid kit.